Made of break-free Korean Made BPA FREE Medical grade LDPE with high tenacity, different from other common plastics, tough and non-rupture that guarantees lifetime use. One-batch forming, smooth to the touch, and comfortable to use! The basic fits to most standard toilet seats and videts with the dimension at 15.3 x 14.3 x 4.3. UNIQUE VENT DESIGN- Water goes everywhere? NO! 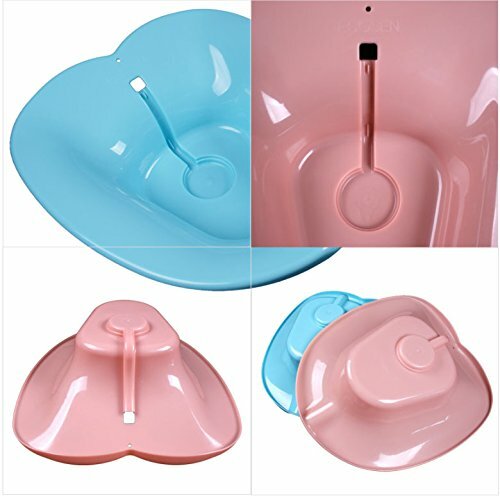 The water only drains out the hole into the toilet with this unique [hole], avoid wetting the floor! Can be hanged on the wall when not use, save space! Universal type Wide contoured edges for added comfort, fits all standard commodes.